When moving into a new home you’ll want the peace of mind that comes from knowing that only you and your family have keys. Even with newly-built homes, however, you can’t be sure that each of the building contractors relinquished all their keys. A recently lost house key would also cause doubts about the security of your home. Under any of these circumstances, homeowners will change their locks. Many homeowners, however, choose a more economical course of action and have their home’s locks rekeyed instead of replaced. How Is a Lock Rekeyed? Here you see a lock cylinder and a box of lock pins behind it. To rekey a lock the locksmith will replace the pins in the lock cylinder so the lock works with a new key. 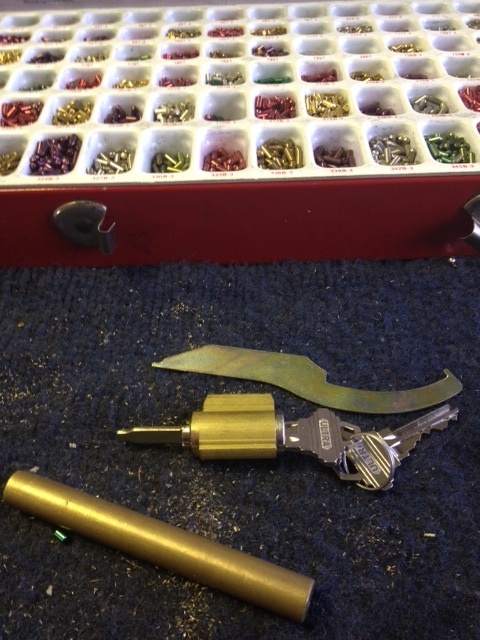 Rekeying a lock involves replacing the key pins located inside the lock cylinder so the lock works with a new key. A working knowledge of how things work inside of a pin tumbler lock is required. A locksmith will determine which key pin sizes are needed to match a new key. A key decoder, pinning size chart and a depth chart are used to decode the pin set-up inside the lock. Which Is the Overall Best Option — Rekeying or Replacing? The advantage of rekeying over replacement is the reduced cost. This assumes that you are happy with your current locks and believe they will provide the desired level of security after rekeying. Upgrading your locks to a newer model or to a type that offers a greater degree of security, however, may be more important. A recent home break-in would be a good reason to consider replacing the existing door locks with an upgraded version regardless of the cost. A comparatively cheap locksmith service call for a rekeying may not be a deciding factor if there are concerns regarding the level of security the existing locks provide. Weighing the lesser cost of rekeying against a new lock installation is only part of the picture. When the security of your home and family are involved, you should choose a certified, registered and insured home locksmith service that will guarantee the work performed. If you’re looking for a locksmith in Wichita or the surrounding area, your choice of Quality Key Locksmithing will provide you with the security, service and honest pricing you and your family deserve. Call us today at 316-469-4959 for a quote or for round-the-clock home or mobile emergency service.